With a fit Michael Vick, Philadelphia have themselves a game changer, and Vick helped the Eagles soar into their second victory. The Ravens were unlucky, but the Eagles were given a second chance, and took their chance well. The replay overturned the ref’s call of an Eagle’s fumble, which allowed Vick to score a TD with 1:55 left, and win the game. The Cardinals were handed a win by the Patriots; and more specifically Stephen Gostkowski, who missed a 42-yard field goal in the final seconds to give Arizona a shock victory. Arizona deserved the win though, sacking Brady four times, blocking a Mesko punt, and Kevin Kolb, the backup QB, ran one TD and threw another. Tampa Bay were 27 - 16 up as the game entered the fourth quarter, and Eli Manning looked off color at best in the first half. 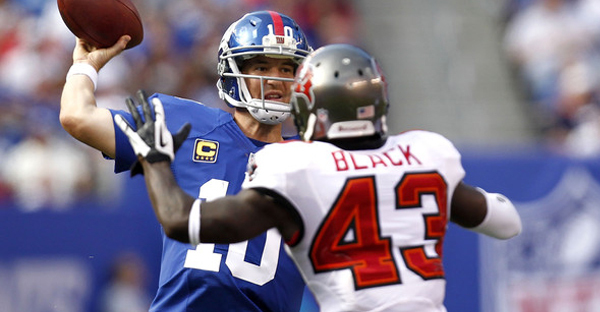 However Eli answered the call of the home crowd and threw three touchdowns, to Nicks, Cruz and Bennett to give the Giants a 34-27 lead, and even after the Buccaneers leveled the score, Manning drove 80 yards to set up Andrew Brown for the winning TD. Bengals’ Andrew Hawkins catches a pass from QB Andy Dalton and left former team Cleveland Browns in his wake for a 50-yard touchdown. See it here! You mention the Ravens this week but neglected them last week in their drubbing of the Bengals! I disagree, points definitely mean prizes! Dull game maybe, but it was still a top performance from the Ravens. Boothy interesting review? However when I watched the Pats game Im pretty sure they ended up losing 20-18 not winning??? Unless I missed something?